McLane Children’s hospital is fortunate to have the assistance of some of their biggest fans, their teenage patients. These amazing teenagers formed a group called the “Teen Advisory Board” to assist the hospital with important decisions and to create a support group as they battled their own sometimes scary diagnoses. These teens wanted to make sure that their peers had a voice in this setting typically designed around younger patients. 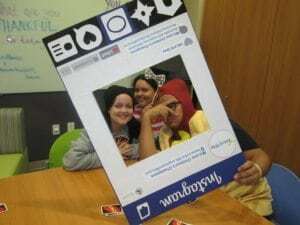 McLane Children’s Hospital Administration was very responsive to this dynamic group and as a result of their involvement, McLane Children’s turned one of their playrooms into a “Teen Lounge” specifically for Teens. These teens meet monthly to discuss ways to help their hospital, and ways to support each other. They are involved in many important decisions for the hospital from event planning to choosing educational materials. We are all very impressed by their passion and ability to bring about change. This group loves their hospital so much that they decided to start fundraising! 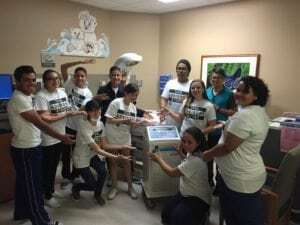 In June of 2016 it was decided by a unanimous vote that they would raise $18,800.00 to fund two pieces of equipment that their hospital needed. Teens gather around the Blanketrol, one of the pieces of equipment they raised funds for. A Blanketrol and a Vein finder. The Blanketrol provides whole body cooling therapy for babies born in an emergency situation may have a lack of oxygen to their brain that can cause brain injury and even death. The Blanketrol can slow and even stop long-term brain injury by slowing the baby’s body systems down, in turn slowing or even completely stopping brain injury! The Vein Finder is a device that allows for easy finding of small veins for IV insertion. Inserting an IV can be especially challenging with small children and the vein finder allows for the vein to be located on the first try and avoids any unnecessary sticks. Many of these teens had either benefitted personally from one or both of these pieces of equipment, or had a family member that had. By September, the teens had received so much community support that they exceeded their goal of $18,800.00 – But did they stop? No way! These teenagers (Despite their own health challenges) decided to keep raising money by using a donation platform called “Extra-Life”. The teens celebrated their success with a “Game Day” in November. To date, these inspirational teens have raised over $26,451.00! Thank you Teen Advisory Board! We hope you know that your gift to this community goes well beyond the dollar amount that you raised. We are so proud of you.